A black and white photograph of Thomas and Jane Kirkland's gravestone in Union Cemetery, Oshawa, Ontario. Thomas Kirkland was born near Tanderagee, County Armagh, Ireland on August 12, 1835. He started early on a career in teaching and took his training at the Normal School in Dublin, and the Albert National Training Institute in Glasevin, studying the theory and practice of agriculture. He then took a course in civil engineering at Queen's College, Belfast, but severe illness required him to seek a drier climate, so he came to Canada in 1854. He was first employed as Assistant Master at the Central School in Oshawa and became principal in 1855. In 1858 he became mathematics master at the Grammar School in Barrie, Ont. From 1863 to 1871 he was Head Master at the Whitby Grammar School. In 1871 he was chosen to be Science Master at the Toronto Normal School, and became principal in 1884. In 1859 he began studies at the University of Toronto, graduating with a Bachelor of Arts Degree in 1870 and a Master of Arts in 1871, with honours in all subjects. Later he became a senator at the University of Toronto and Knox College. For a few years he held the chair of chemistry and physics at Trinity Medical School, and lectured on botany. He was author and co-author of a number of mathematics textbooks. On July 20, 1863, in Oshawa, he married Jane Todd Thornton (1837-1899), daughter of Rev. Robert Hill Thornton, the first Presbyterian minister in Whitby Township. 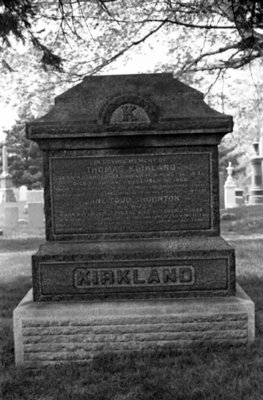 Thomas Kirkland died in Toronto on December 31, 1898, and is buried in Union Cemetery, Oshawa. Thomas Kirkland Family Gravestone, Date Unknown, Brian Winter. Whitby Archives A2013_004_457C.